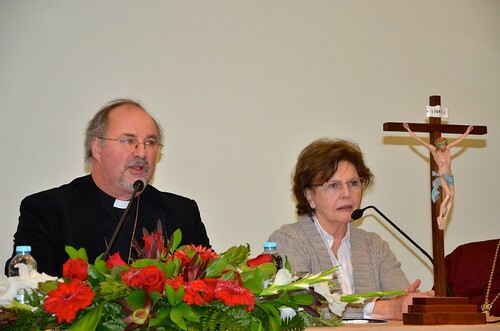 I would like to report on the retreat held in Fatima during the week of Prayer for Christian Unity from 22nd to 25th January of this year to pray for Christian Unity. I will report in the only way that I know which is from my own personal and lived experience. We were in the Octave for Christian Unity which is celebrated around the world each year and which starts on Jan 18th (Vassula’s birthday) and ends on 25th January (Conversion of St Paul, the apostle to the Gentiles). Both Pilar de Oriol and I, together with our spouses, put in many long hours of preparation. We had asked to be able to say Mass in the Apparitions chapel and also the Resurrection chapel and since there were processions at night around the sanctuary, we agreed to carry the statue of Our Lady and the Illuminated Cross. 240 people attended from 22 different countries! There were: 9 Catholic priests which included Monsignor René Laurentin and Monsignor González-Agápito, 2 Brazilian priests, 1 Argentinian, 1 Spaniard, 1 Portuguese and 1 from the Czech Republic. In addition there was also a Greek-Orthodox Archimandrite and an Anglican priest who took part. So we were Catholics, Orthodox and Anglicans. I would also like to thank Father Milheiro and Sisters Isabel and Arminda for their attendance and help in advertising the retreat. They are doing a truly wonderful job bringing the messages to all 22 Portuguese prisons where there have been innumerable conversions which have been printed in several volumes. There was also Father Ángel Antonio with a large group of religious from the Congregation of St. Michael the Archangel. 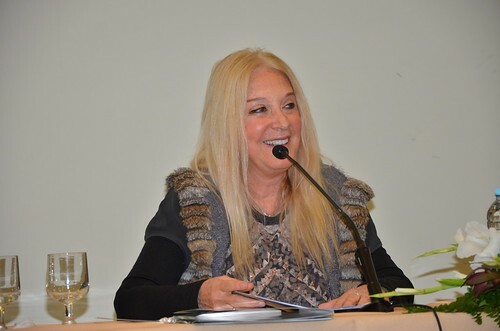 The talks were given in the conference room of the hotel and Pilar had the demanding task of translating from English to Spanish and vice versa. I would especially like to mention Father Laurentin, who in spite of his advanced years, wanted to accompany his beloved Vassula on this retreat. He has been a great friend and defender of Vassula for the last 20 years and has never failed her. The retreat began in the afternoon of the 22nd with a short introduction and some words from Vassula. We then went to the Apparitions chapel for Mass which was presided by Monsignor González-Agápito, accompanied by Catholic priests from our group. When I saw our group occupying most of the seats in the Apparitions chapel with our priests on the altar, I felt a great joy. We were there where Our Lady of the Rosary had appeared 97 years earlier. On Thursday the Mass was celebrated in the Byzantine rite in the Chapel of the Resurrection. It is the Divine Liturgy of St. John Crysostom, which has been celebrated by the oriental Catholics and the Orthodox since the middle of the fourth century to the present day, without having been affected by the Great Schism of 1054. Mons. González-Agápito, who is very knowledgeable about the oriental liturgy celebrated it partly in Greek and partly in Spanish. We were able to follow it thanks to some booklets which were made available. The chapel was completely full. The singing and incense filled the air and gave it a profound sense of the sacred. In the afternoon we had the Stations of the Cross. I took the decision for them to be read in four languages, English, French, Spanish and Portuguese instead of using the cabins for simultaneous translation. I don’t think it was a good decision since it was too long. Each ‘language group’ followed the Way of the Cross is his own language, which was taken from the messages of True Life in God which are really moving. Then came the talk of the Greek Orthodox Archimandrite, Father Nikolaos. His talks are always both enjoyable and profound. He carried on with the same theme as Mons. G. Agápito. Following this, there was the ‘healing service’. Several priests laid their hands over the people and Vassula, with a cross in her hand, prayed over each person as they came forward. Many fell in the “rest of the Spirit” whilst the Brazilian group sang songs to the Holy Spirit. After supper we went to the Apparitions chapel to pray the Rosary. 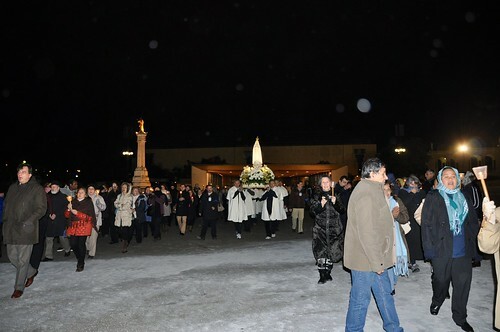 We had agreed to carry the statue of Our Lady of Fátima and the Illuminated Cross during the procession. That’s exactly how it was, with our priests following and then everyone else from our group. We then went to the Basilica of Our Lady of the Rosary (the oldest) where the bodies of the 3 little shepherds lie. There was Eucharistic Adoration and D. Salvador, Mons. Gonzaléz-Agápito’s secretary, was in charge of the liturgy, playing the organ and also singing the chants. It was the perfect end to the day: adoring Christ in the Eucharist. On Friday we returned to the Chapel of the Resurrection. We had our traditional Mass in the Latin rite, which was concelebrated by all the Catholic priests and presided over by Mons. González-Agápito. 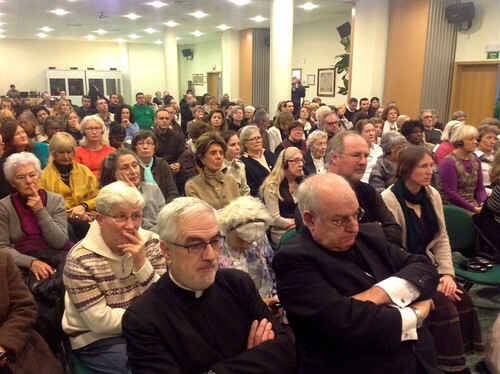 Once again we filled the chapel which had a capacity of more than 200 people. Let’s now talk about the third point of view with regard to Christian Unity, that of the Anglicans. Father Ashenden gave us a magnificent talk, which complemented the previous ones and illuminated and clarified aspects of the Anglican Church that we were ignorant about. In this way we are building Ecumenism in our hearts: by recognising and embracing the riches of other Christian denominations whilst preserving the riches and traditions of our own church. In essence we are putting unity in diversity into practice. Everyone, Mons. 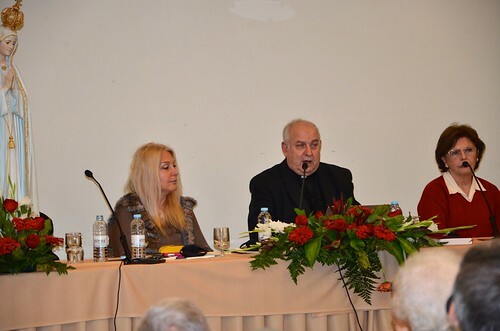 G. Agápito, Archimandrite Nikiolaos and Father Ashenden gave us a quick history lesson on Ecumenism from the point of view of their Church, whilst alluding to Jesus’ messages to Vassula and the assertion that UNITY WILL COME. In the afternoon there was the much awaited talk of Vassula. The room was fuller than ever since some Portuguese had come that afternoon just to listen to Vassula since they couldn’t attend the whole Retreat. And her talk met all expectations. Vassula spoke about UNITY, making frequent reference to the messages that she had received from Our Lord. We have all the talks recorded and we hope that they will soon be available for you to hear or read. After a break the witnessing began. It started with a Polish seminarian giving a powerful testimony of his conversion, reading the messages of TLIG on the internet, which led him from drug addiction to the seminary. I was also very moved by a laicised Portuguese priest, who had retained his spiritual ideals and who recognised Vassula as a prophet on a level with the prophets of the Old Testament. There were spontaneous testimonies, among which were 2 people who had seen the face of Christ on Vassula. One was a Spanish woman who had seen it in Madrid years ago and it had just happened to her again in Fátima. There were also 2 singers who performed for us: Tania, from Peru sang Schubert’s Ave Maria, and Thalia from Greece sang one of her compositions based on the messages of True Life in God. The afternoon ended with my talk, supported by 50 slides. It was my best talk, much better that I had imagined. Why? Because I did it in conjunction with Vassula who offered a couple of insights which greatly enriched my talk. It was a joy to be able to give a talk supported by Vassula. I wish we could do it more often. After supper, we again said the Rosary in the Apparitions chapel followed by the procession with our group carrying Our Lady and the Cross. 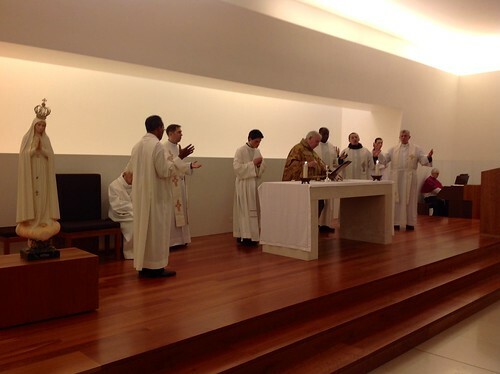 On Saturday morning we had our Mass in the Apparitions chapel which was celebrated by Father Fabián Díaz, accompanied by various priests from our group. This Argentinian priest is a personal friend of Pope Francis who invited him aboard the ‘Popemobile’ a few days earlier when he was visiting Rome. His Mass and homily were full of Marian fervour. It was a Mass of thanksgiving. I couldn’t thank Jesus and Mary enough for how well everything had worked out. Thank you Jesus! Thank you Mary! The Mass was the crowning glory of our Retreat. This has been a simple account of what happened, a chronicle. Finally I would just like to mention the atmosphere. We felt like a real family. There was cordiality, affection, UNITY and happy smiling faces. People from 22 different countries, different languages and various Christian churches felt like brothers and sisters. 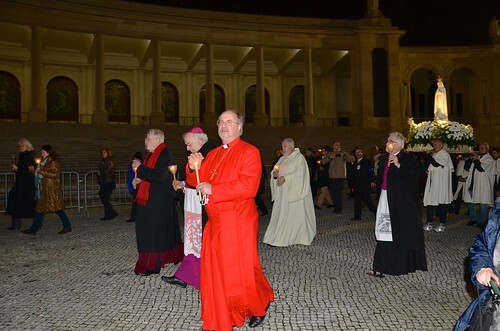 We felt quite at ease and in an atmosphere of peace and with a burning desire to be at the service of Jesus and Mary who were there with us and who made their presence felt. Your Words are Truth and Life and we have tasted it during these days.